Anthurium armeniense Croat, sp. nov. TYPE: Guatemala. San Marcos: ca. 2 km from Finca Armenia above San Rafael, 1,100-1,250 m, Croat 40905 (MO-2599479, holotype; Live at MO). Planta epiphytica; cataphyllum persistens intactum, brunneum; petiolus 19-28 cm longus; lamina ovata, 20-40 cm longa, 11.5-21 cm lata, basi cordata profunfde; inflorescentia erecta aut effusa; spatha alba; spadix caesius aut roseus, 3-5.7 cm longus, fragrans; tepala marginibus elevatis; baccae aurantiacae. Epiphyte; stems 1.5 cm diam. ; leaf scars ca. 1.5 cm wide; roots 4-5 mm diam., descending; cataphylls subcoriaceous, 7 cm long, rounded to emarginate and cuspidate at apex, drying reddish-brown and persisting intact. LEAVES erect-spreading; petiole 19-28 cm long, 4-6 mm diam., terete; geniculum 2-3 cm long; blades narrowly ovate, gradually acuminate and downtumed at apex, deeply lobed at base, 20-40 cm long, 11.5-21 cm wide, broadest at middle; anterior lobe 5-15 cm long, the margins broadly rounded; posterior lobes 5-12 cm long, directed downward to inward; sinus usually spathulate sometimes hip-pocrepiform, acute to rounded at apex; both surfaces semiglossy, the upper surface with ± conspicuous, minute, linear, raphide cells; midrib obtusely raised above, weakly sunken at apex, raised on lower surface; basal veins 4-6 pairs, the second to third pairs coalesced ca. 1.5 cm, the fourth to sixth coalesced ca. 2.8 cm, raised above and below, diminishing and flat at collective vein; primary lateral veins 2-4 per side, flat above, sunken below, departing midrib at 55°-60° angle, curved to margin, loop-connected; collective vein arising from the first basal vein, 4-15 mm from margin. 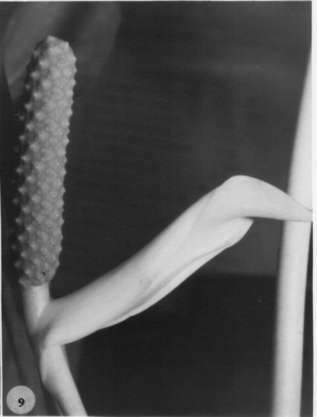 INFLORESCENCE erect or spreading; peduncle 11.5-23 cm long, 2-3 mm diam., terete, as long as or longer than petioles; spathe white, narrowly ovate-elliptic or lanceolate-oblong, 4.5-9(12) cm long, 1.9-3 cm wide, broadest near base, long acuminate, green at apex, obtuse to acute at base, decurrent ca. 2 mm, inserted on peduncle at 70° angle; the stipe 2 cm long in front, 3-5 mm long in back, usually curved; spadix pale lavender (B & K Purple 6/ 5), fading to pink (B & K Red-purple 6/2.5) at anthesis, 3-5.7 cm long, 7-9 mm diam. at base, 6-7 mm diam. at apex, the flowers rhombic to weakly 4-lobed, 2.1-2.9 mm long, 2.8-3.6 mm wide, the sides straight to weakly and irregularly sigmoid, ca. 6 flowers visible in the principal spiral, 9 flowers visible in the alternate spiral; the tepals matte; lateral tepals 1.6-1.9 mm wide, the inner margins straight to convex; pistils white, emergent ca. 0.5 mm, the stigma broadly elliptic, whitish, brushlike with short papillae exsertcd above pistil; first lateral stamens emerging irregularly throughout, followed rapidly by second lateral stamens then alternates in rapid succession; anthers white, broadly ovate, 0.5-0.8 mm long, 0.8-1.4 mm wide; thecae broadly ovate, shallowly cupular, pollen white, abundant, strong sweet lilac scented. INFRUCTESCENCE pendent; spathe greenish-while, spadix 18 cm long, 3.5 cm diam.. with berries exserted ca. 1 mm (early stages); berries obovoid, style dark, beaked at apex, pale orange (B & K Yellow-red 8/7.5), 1.2-1.5 cm long, 68 mm wide; mesocarp orange, juicy, gelatinous with numerous silvery raphide cells; seeds (1)2. ovoid-ellipsoid, pale whitish-green.darkergreenat base,reddish-brown at apex, weakly flattened. 4.5 mm long, 3-3.2 mm wide, 1.4-2.2 mm thick, surrounded by sticky, gelatinous, translucent substance, more prominent at lateral margins, extending beyond ends. Figs. 9 and 14.
evident on upper surface and by its thick, persistent cataphylls that dry reddish-brown, but especially by its pale lavender to pink fragrant spadix that has a distinctly bumpy surface owing to the slightly upturned edges of the tepals. The species also is characterized by its while spathe. 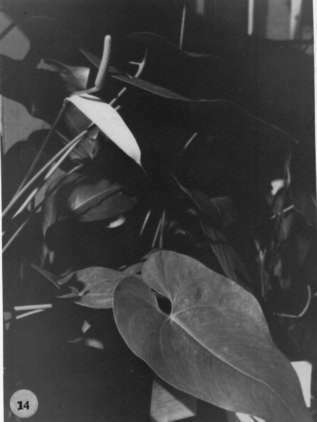 It is confused with A. huixtlense, which has similar leaves and cataphylls (both are in the section Calomystrium), but that species generally has a greenish spathe and a spadix that varies from white to lavender, and has tepals more nearly level with the surface of the spadix so that it does not have the bumpy appearance. In addition, A. huixtlense lacks the strong lilac scent of A. armeniense. Guatemala Quezaltenango: 1200-1300 m, 14.45N 91.32W, 22 Jan. 1987, Thomas B. Croat & Dylan P. Hannon 63434 (MEXU, MO). Guatemala San Marcos: La Trinidad,, 25 Jan. 1986, Christenson 1146 (MO). Guatemala San Marcos:, , Thomas B. Croat 40905 (MO). Guatemala San Marcos:, , Thomas B. Croat 40923 (MO).